Not a fan of Christmas pudding? These are the cupcakes for you – they look like the real thing but are in fact a sneaky alternative version. The cupcakes are made with Sugar and Crumbs Chocolate Orange Cocoa Powder and chunks of chocolate orange, and topped with a fabulous white chocolate ganache. The red berries are an optional flourish, but they do really complete the effect. Preheat the oven to 200°C (180°C fan). Beat the eggs until pale and frothy, and then mix with the vegetable oil and milk. Add the sugar and whisk to combine. Next, add the flour and the Sugar and Crumbs Chocolate Orange Cocoa Powder and mix again – it’s important not to overbeat the mixture, or it will end up chewy, so just stir until the bigger lumps have disappeared and don’t worry about the little ones. Roughly chop the orange chocolate (I bought a bag of those Terry’s Chocolate Orange minis, which are ideal for the job – just cut each one into three) and stir through the cake batter. Grease a muffin tin and fill each cup about two-thirds of the way up with the cake batter. Bake in the preheated oven for 22 minutes, and then allow the cakes to cool in the tin for 5-10 minutes before removing them – the melted chocolate will make them a bit delicate, so be gentle. Place on a wire rack to cool completely. To make the ganache, pop the white chocolate and double cream in a bowl and microwave in thirty second bursts, stirring each time – you’ll probably only need a couple of bursts – until you have a smooth, well-combined mixture. Leave this to cool until it takes on the texture of treacle – i.e. loose enough to create drips, but very slow-moving ones. Cut a small slice from the top of each cupcake, creating a flat surface so you can turn them upside down and stand them up. Top each one with a spoonful of ganache – it might take you a couple of goes to get the hang of creating nice drips, but you’ll find it helpful not to add too much, to start with. 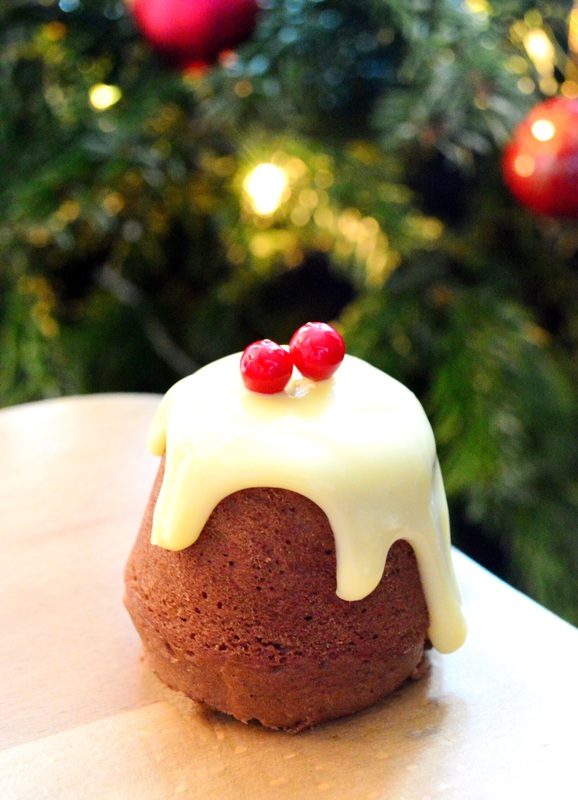 Finish off each cupcake with artificial holly berries.